Seamless, Cordless AC Power - ANYWHERE You Need it! 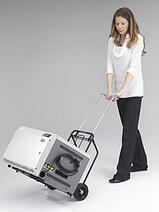 The PowerPack Mega Series Portable Power System provides quiet, seamless AC power for as long as 12+ hours at a time. This sturdy, compact unit is ideal for powering computers, printers, POS Systems, scales, testers and any other electronic hardware. At the end of your shift or use, simply plug the unit into a standard wall outlet to recharge. Eliminate the need for extension cords or noisy generators! 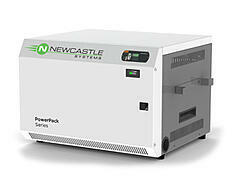 Housed in a sealed but fully ventilated steel cabinet, the PowerPack Series comes standard with an inverter (modified sine wave, input 12 volts, output 115VAC, 60 Hz), battery, smart charger (20 Amp, with automatic shut off) and fusing system. 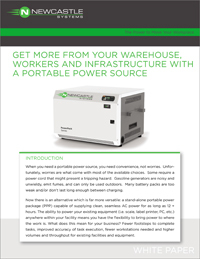 Non-powered equipment carts * Outdoor mobile concessions * Remote Display Areas * Areas where power is not available such as far corners of the warehouse, loading docks, remote storage areas, and much more.